In the nearly 23 years since Frank Zappa died a few weeks shy of his 53rd birthday, the iconoclastic musician's legacy has been the foremost product of the Zappa Family Trust, in essence a cottage industry devoted to the preservation and propagation, under tightly controlled circumstances, of Zappa's music. The resulting fracas, a tangle of lawyers, injunctions and wrangling over music licensing and grand rights, has created such a cloud of legal dust that it threatens to obscure the life and work of the man whose genius the Trust purports to celebrate. 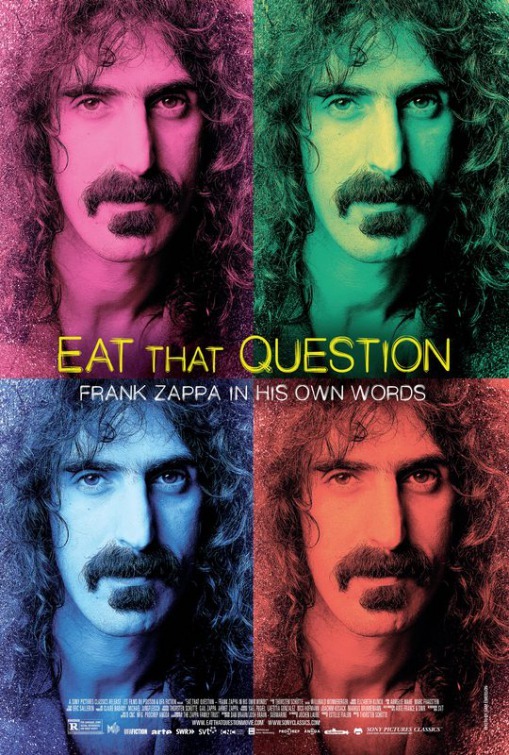 Hence the importance of a documentary like EAT THAT QUESTION: FRANK ZAPPA IN HIS OWN WORDS, which returns the man in question to his rightful place in the spotlight, as a late-20th-century thinker, political gadfly, musical theoretician, composer, bandleader, and a guy with a superlative way with a Gibson SG. Director Thorsten Schütte constructs his hour-and-a-half essay entirely from a myriad of documentary sources — much of it featuring Frank Zappa being interviewed over the decades, from his peculiar appearance on the Steve Allen show (where like a disciple of John Cage he plays a bicycle while the house band engages in controlled aleatoric bleeps) to one of his last interviews, in which he pushes back against yet another clueless media type who asks him what he'd like his legacy to be (“It's not important to be remembered.”). In between, we're treated to a well-edited montage of talk, concert footage (much of it not seen for quite some time) and a generous serving of Zappa's freewheeling music, which over the course of a lifetime ranged from exquisite doo-wop parodies to dissonant and challenging concert works for orchestra. 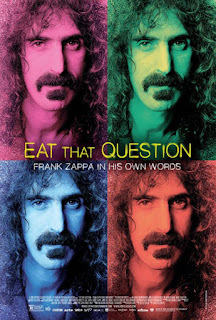 In truth, EAT THAT QUESTION (which takes its title from Zappa's 1972 fusion instrumental that goes unheard in the movie) tells us nothing we didn't already know about Frank Zappa. Its value is found in the presentation of this data in the first person — Zappa talking in his peculiarly intelligent way about the many different things he believes in. In 1985, Zappa brought his point of view more directly to the culture wars when he testified before Parents Music Resource Center hearings in Washington, D.C. The PMRC was advocating a ratings system for recorded music like the one in place for motion pictures. A significant number of artists, ranging from Dee Snider to John Denver, testified in opposition to the proposal, but the most famous testimony came from Zappa. "The PMRC proposal is an ill-conceived piece of nonsense which fails to deliver any real benefits to children, infringes the civil liberties of people who are not children, and promises to keep the courts busy for years dealing with the interpretation and enforcement problems inherent in the proposal's design," Zappa famously said. He later referred to the senators' wives, like Tipper Gore, who created the Resource Center, as "the wives of Big Brother." Censorship was nothing new to Zappa, who founded his own record label, Bizarre Records, after a dust-up with MGM over the lyrics to "Let's Make the Water Turn Black," which in part ran, "And I still remember Mama with her apron and her pad, feeding all the boys at Ed's Cafe." Recalling it in an interview in the film, Zappa's look of incredulity that the execs at MGM could hear that as a description of a sanitary napkin is priceless. The interview footage presents a marvelous first-person biography, but equally valuable is the extensive concert footage, including rarely seen performances by the original Mothers of Invention, as well as the beloved line-up that featured George Duke, Chester Thompson, Tom Fowler, Napoleon Murphy Brock and the amazing Ruth Underwood tearing through some of the most fiendishly difficult jazz-rock-avant-garde fusion ever concocted. "I've always wanted to be a serious musician," Zappa tells one interviewer, and throughout his career, he composed chamber and full orchestral scores in stylistic homage to his musical gods Edgard Varese, Igor Stravinsky, and Anton Webern. It's to his credit that while the spirits of these masters hover over his music, Zappa's unique musical personality is central to the sound. The last sight of Zappa the movie gives us is particularly poignant. Ravaged by cancer and close to death, Zappa conducts, with his eyes closed in concentration, an unseen ensemble in the seminal percussion piece by Varese, Ionisation, the work that started it all for him when he encountered it on the obscure EMS label and realized that this music, so difficult that his friends thought him crazy for listening to it, represented his artistic destiny. 4 out of 4 stars.